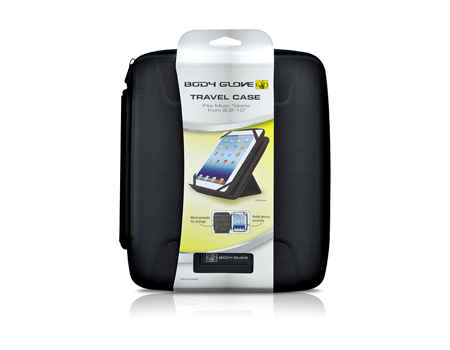 This hard-shell travel case is designed to keep your device free from bumps, bangs, and scratches. Body Glove's Hard Shell Travel Case is designed to keep your device free from bumps, bangs, and scratches while on the go. The inside of the case contains mesh pockets for accessory storage. Flip the zipper inside out to hold with one hand or pull out the stand for hands-free reading on planes and trains or even at your desk.